The previous two pieces in my series of essays on Jean-Luc Godard have covered his relationship to philosophy and politics. But to consider these concerns divorced from the form of Godard’s art would be incorrect. 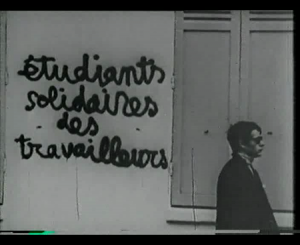 More than anything, Godard’s career-long project is to explore these connections, the intersections between art, philosophy and politics. Through his films, Godard articulates a total aesthetic worldview, a constructed visual space where the boundaries separating art from philosophy and politics are erased. The rare, three-minute short Film-tract nº 1968 provides an unlikely but convincing example of this artistic project, a nearly-forgotten work made at a pivotal moment both for Godard’s career and European culture at large. Film-tract nº 1968 was made in collaboration with the French painter Gérard Fromanger. It’s a recreation of sorts of Fromanger’s Le rouge, in which thick gobs of red paint bleed across the white and blue of the French flag. 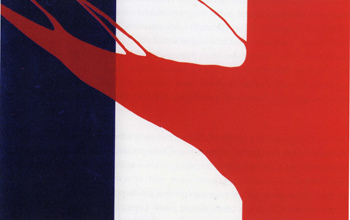 The film expresses a simple aesthetic idea, but its form is deceptively complex, illuminating many of Godard’s theoretical interests in the nature of art, among them: the fertile but often volatile meeting point between two visual media; the importance of chance in art; and the relation of art to politics during one of the most exciting cultural moments in contemporary French history. Film-tract appears to be a riff on another collaborative film project of 1968 called Cine-tract. Created by many influential New Wave filmmakers including Godard himself, each numbered “cine-tract” was an independently produced one-roll film, feeding off the rebellious street spirit in the air and meant to provide an alternative to the mainstream news. The title of Film-tract nº 1968, including its “number” of 1968, seems a play on the cine-tracts, and indeed the ideology expressed by both works is consistent. Film-tract opens with its title painted in red on the front page of “Le monde,” emphasizing the bleeding-edge urgency of its political attack on contemporary France. The red paint spills like blood, slowly covering the flag in a shameful stain of violence. The movement of the paint suggests an invasion, a spreading of state ideology over the country at large. This interpretation seems particularly convincing given the increasingly political films Godard would come to make after the monumental turning point of May ‘68. Equally interesting, however, is the film’s articulation of a meeting point between the art of painting and the art of film. In a typical comparative reading of both forms, the cinema is thought to exist in an additional dimension beyond painting: time. As a temporal medium, cinema adds the element of movement or change to painting’s static image. The introduction of the camera, however, adds a second dimension to this new pictorial-cinematic experience of motion. By moving the camera to continually re-frame portions of the canvas, the artists introduce a new force of movement within the image. The camera even adds a sense of narrative to the work. Beginning within the red stripe of the flag and slowly moving left across the white and blue stripes, the film suggests a development over time not present in the painting alone. Indeed, Godard’s framings (at least, it’s safe to assume the framings are Godard’s; his credit reads “Technique”) suggest he is interested in probing precisely this intersection between cinema and the fine arts. In Film-tract, this border is literalized, located within the movement of the red paint into the white (blank, negative) region it contaminates. Godard further animates the boundaries of the encroaching red paint with his camera, emphasizing, by extension, the project’s existence at the nexus between painting and cinema. The edge of the filmic frame, the edge of each of the flag’s three stripes, and the edge of the canvas itself all converge to emphasize this theme of eroded borders. Film-tract nº 1968 also contributes to a theme present in all of Godard’s work, from Breathless to Goodbye the Language: the role of contingency and chance in art. The very nature of working with film—a medium that records reality—dictates at least some intrusion of contingency, no matter how rigorously planned a shoot may be; cinema can only exist against the push-back of the world. More than most filmmakers, however, Godard encourages contingency in this films, developing tactics of improvisation in writing, shooting, directing actors and editing. As a one-roll, one-shot film, Film-tract embraces contingency through its own formal construction: the motion of the paint could only have been captured “live” over the length of its single shot. Both Godard and Fromanger also play a roll in the randomness of the film’s action. Fromanger’s method of painting is itself very performative, and by lifting the surface of the painting at various speeds and at various angles, he coaxes the paint to fall as it may, with little premeditation on the part of the artist. Godard, for his part, embraces contingency by selectively framing portions of the canvas, motivated as much by whim as by design or by the path of the paint. His camera moves laterally with the red paint, but selectively, and movements along the z-axis—away from or towards the painting’s surface—add another dimension to the filmic frame. On its surface, Film-tract nº 1968 may seem facile and slight. 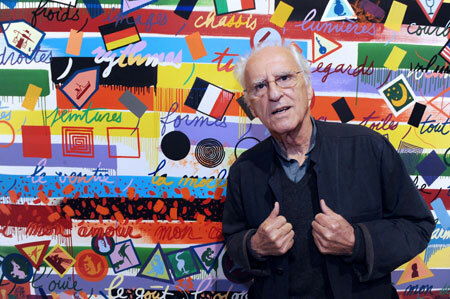 However this collaboration between Godard and an artist of another medium, a true pictorial-cinematic hybrid, offers an opportunity to encounter Godard’s unique relationship to artistic form. 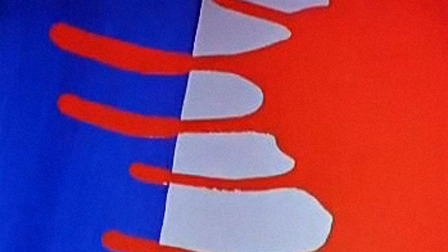 As a filmmaker, Godard is nothing if not eclectic, employing every technique imaginable to construct new relationships between images. Film-tract nº 1968 shows that Godard’s formal exploration in not just a directorial interest, but part of a larger philosophical stance on the power of the image, a position reaching far beyond the cinema to encompass politics, philosophy, and all realms of life. Read more essays and articles about Jean-Luc Godard here.